With sporadic-E (Es) season underway I decided to be active even though, unlike last year, I chose to not bother with a 6 meter antenna. In fact I've made no changes to my station this year, which is a subject for another time. For the present I am selecting the antenna that seems to work best on 6 meters, on the basis of receiving signal level, which is my Hy-gain Explorer 14 tri-band yagi up 15 meters. The antenna works surprisingly well once the mismatch has been tamed by the transceiver's internal tuner. In the past several days I added 7 DXCC countries (now 18 on this band) and made close to 100 QSOs in the ARRL June VHF contest while operating part time. But how to tell how well it works? Perhaps the best way is to compare performance with another station while quantifying as far as possible the differences. The opportunity arose when I recently added 6 meters to a friend's K4KIO Hex Beam, a kit he omitted when the antenna was bought a few years ago. I only had the idea when I found that we were calling the same DX stations. Although we are some distance apart we can hear each other on ground wave. We are enjoying the friendly competition. Since we are both experienced DXers our techniques are comparable. This matters since a timid, overly aggressive or inexperienced operator will often lose out when the opening is marginal and the competition fierce. I'll step through the elements of the station comparison then discuss how we fared against each other. While I was on his tower I noted that his antenna is at the very same height as mine -- 15 meters -- with a similar flat topography in the direction of Europe. There are more houses around me while he has more trees in his semi-rural location. A more exact comparison would be extremely difficult. Let's call this one a draw. The hex beam is a two-element yagi on all bands from 20 through 6 meters, with separate wire elements for each band. The elements, and especially the driven element, have numerous bends. The bends reduce gain a small amount below the 7 dbi that theoretically possible for a 2-element yagi. I would estimate the gain on 6 meters to be 6 dbi. The Moxon-style coupling between elements affects F/B and match but not gain. Much to my surprise the Explorer 14 has a F/B on 6 meters. I expected it to behave more like a long dipole. While it does exhibit the additional lobes (6 total) of a long dipole there is about a 2 S-unit different in ground wave received signal strength between the forward and backward (broadside) directions. I measured this with the VE3WCC beacon on 50.009 MHz in FN15. I receive the beacon at S5 strength when pointing its direction. With no way to measure the actual gain I can only go on what I can measure and theory. For theory I followed the principle of subtractive arrays that when signal is removed in one direction it appears as gain in another direction. However it takes a lot of F/B to add noticable gain with the yagi elements loosely coupled on 6 meters due to element separation. My guess is 3 dbi gain, or about 1 db better than a simple dipole. 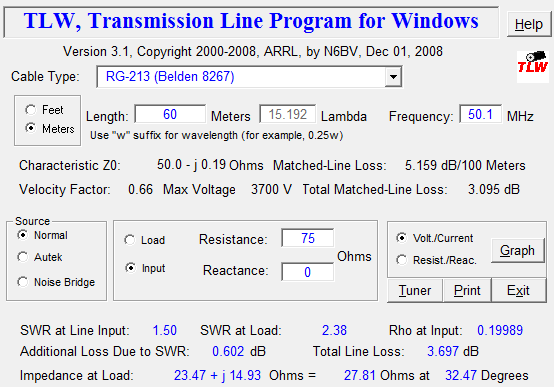 My transmission line length is about half his: 30 meters vs. ~60 meters. Mine is a single length of RG-213 in very good condition; his is approximately half "well-aged" RG-213 and almost new LMR400. Loss can be accurately measured though not easily or conveniently enough for this casual comparison. 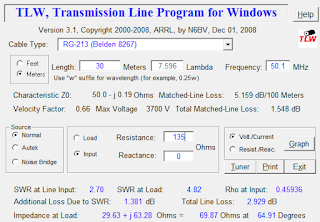 Instead I plugged some numbers into TLW to estimate the transmission line loss. 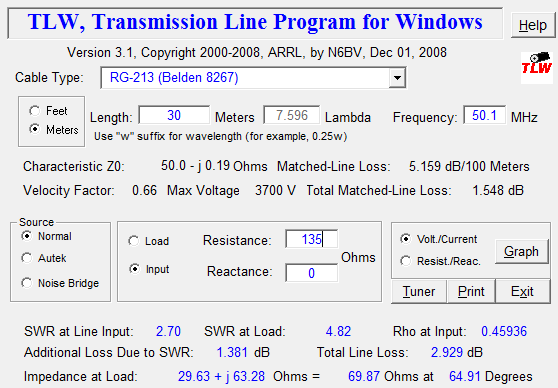 I assumed that the RG-213 in my station has a loss comparable to new cable. In his I mentally balanced the higher loss of his weathered RG-213 and the better quality LMR400 and judged it to be comparable to a single run of new RG-213. The input side SWR at his station is 1.5 and 2.7 at mine. TLW does the rest once I find a combination of resistance and reactance to give the measured SWR. It is sufficient to set the reactance to zero and only adjust the resistance in this exercise since both components rotate around the Smith chart many times along the coax which is long compared to wavelength. I could have measured these values at my station easily enough but there was no point. I use a tuner; he doesn't. Compact tuners for such a wide frequency range -- 1.8 to 54 MHz -- can be quite lossy at the extremes of the range. Loss further increases with the ratio of the impedance mismatch. 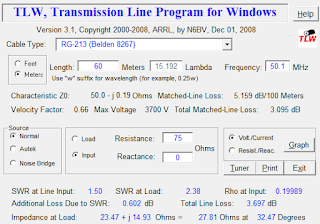 I'll be optimistic and guess -1 db of tuner loss for the input side SWR of 2.7, which equates to 4.8 at the load due to transmission line loss. It is possible to achieve greater accuracy by comparing power output to my Bird dummy load. I have done so in a casual fashion, enough to tell that the loss is probably not as great as I estimated. I am being conservative in my estimate to compensate for my avoidance of rigourous testing. With all the numbers in hand I proceeded to plug them into a spreadsheet and do the sums. The difference is ~3 db. Although not large it is significant. Who wouldn't want 3 db of performance, on any band? Now we come to the on-the-air comparison. Does his 3 db beat me out? To my surprise the answer is a firm "no". A few DX stations would respond with "VE3?" when we called simultaneously, yet it is a toss-up for who got through first. Repeated several times with different DX stations, and the vagaries of different fading patterns at our separated locations, we seem to do equally well. Perhaps equally poorly is more correct. In a couple of cases neither of us made the QSO, never getting beyond copy of our commonprefix at the other end. Alternating our calls rather than calling atop one another made no appreciable difference. One has to question whether the comparison is valid or whether 3 db is less of an improvement than we might wish to believe. To that I have no good answer. What it ought to make you wonder is how far you will or should go and how much you will spend to gain a decibel or three. Some will go quite far. Others refuse to go there at all. There is no magic balance point that represents an optimum of performance or finances. It's a personal choice. Then there are the exogenous factors of terrain and propagation that are quite a lot more difficult to deal with. A comparison like the one described serves only to demonstrate how elusive performance gains can be in practice.